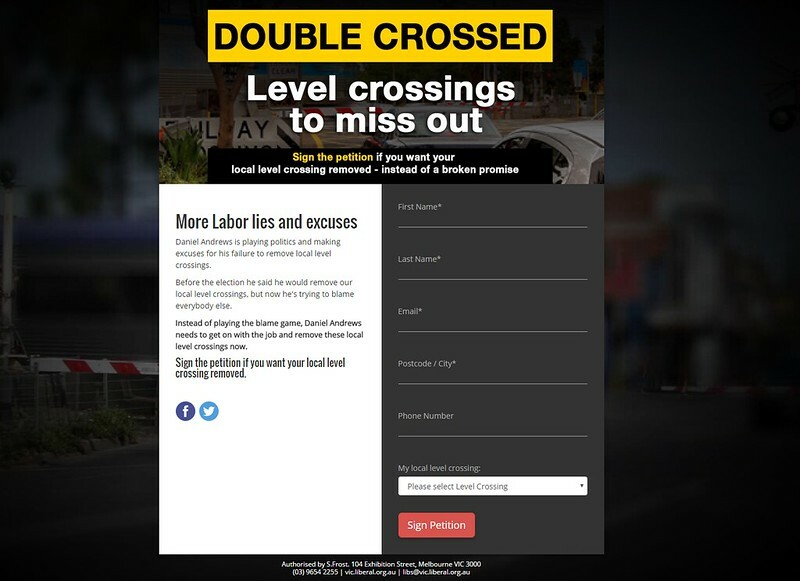 Liberal Caulfield MP David Southwick has a campaign running to get the Glen Huntly level crossing grade separated. I somewhat cringe at the “Blame Labor” rhetoric, but the rest of it I agree with completely. 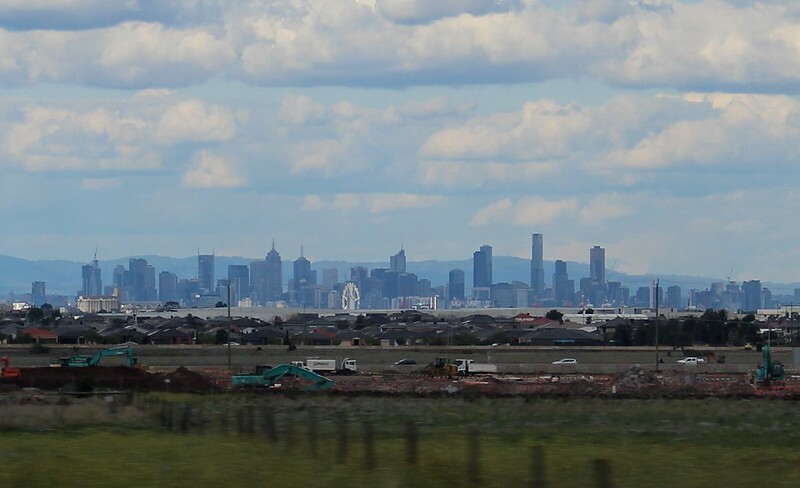 A 2014 report by VicRoads found the Glen Huntly Rd level crossing to be of the highest priority for removal with boom gates expected to drop for 82 per cent of the morning peak between 7am and 9am within seven years, rendering the crossing virtually impassable. The Glen Huntly Rd level crossing is also traversed by trams on route 67 between Melbourne University and Carnegie that are also subjected to significant delays. The Glen Huntly Rd level crossing needs to be removed for safety and to prevent gridlock. 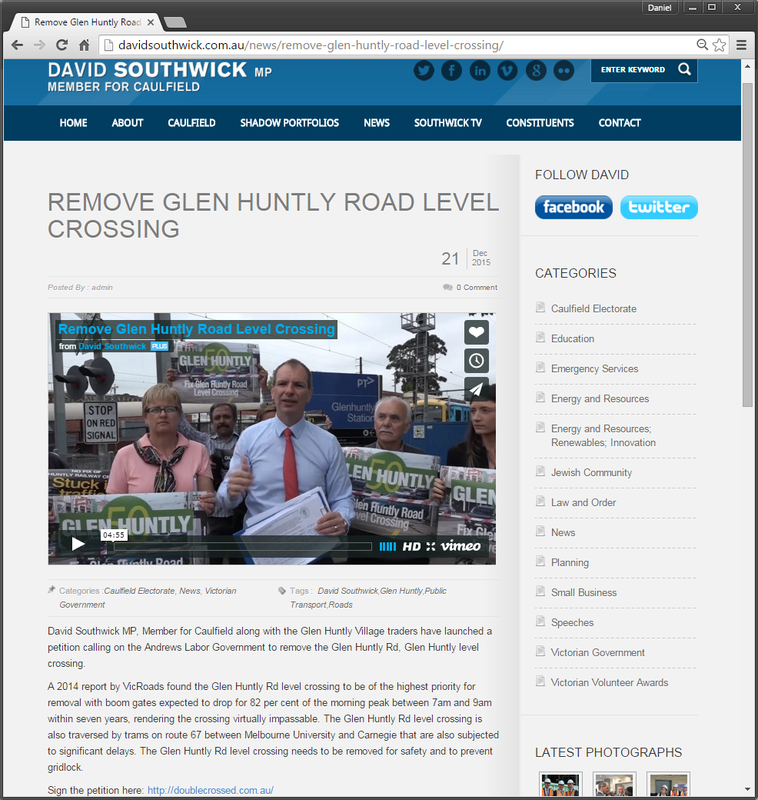 Remove Glen Huntly Road Level Crossing from David Southwick on Vimeo. I lived in the area for 8 years, and know only too well that the train/tram crossing causes suburban and freight trains to slow to a crawl, delaying pedestrians, trams, cyclists, buses (on nearby Neerim Road), ambulances (there’s an ambulance station further west on Glen Huntly Road) — as well as train passengers both trying to get in and out of the station, and on the trains themselves. Even express trains have to slow down to 20 km/h. But clicking through, what do we find? That’s not what I want to support. I want to support removing the Glen Huntly level crossing. Indeed, thanks to the reclaimed swampland in the area, it’s possible that the only practical way of doing it might be to use elevated “Skyrail”. 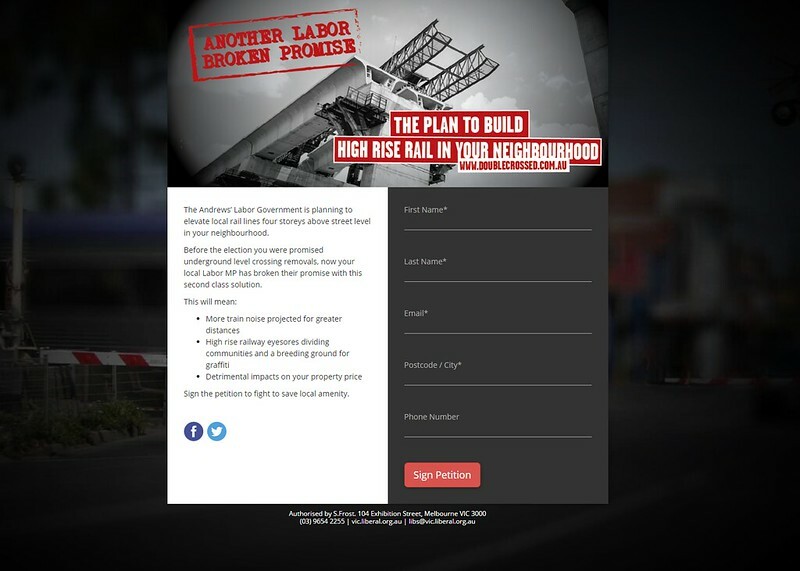 Early this year when it was revealed the government planned the Caulfield to Dandenong crossings to be elevated, the Libs changed tack and the Double Crossed web site became the “anti high rise rail” petition you see today. But nobody updated David Southwick’s links. And I wonder how many other Liberal MPs have similar campaigns now inadvertently linking to anti-Skyrail petitions? Other Liberals have links to it, but they are clearly about Skyrail. So where do I sign in support of removing the Glenhuntly crossing, but keeping a neutral stance on Skyrail? Perhaps I’ll need to go into his office to sign. 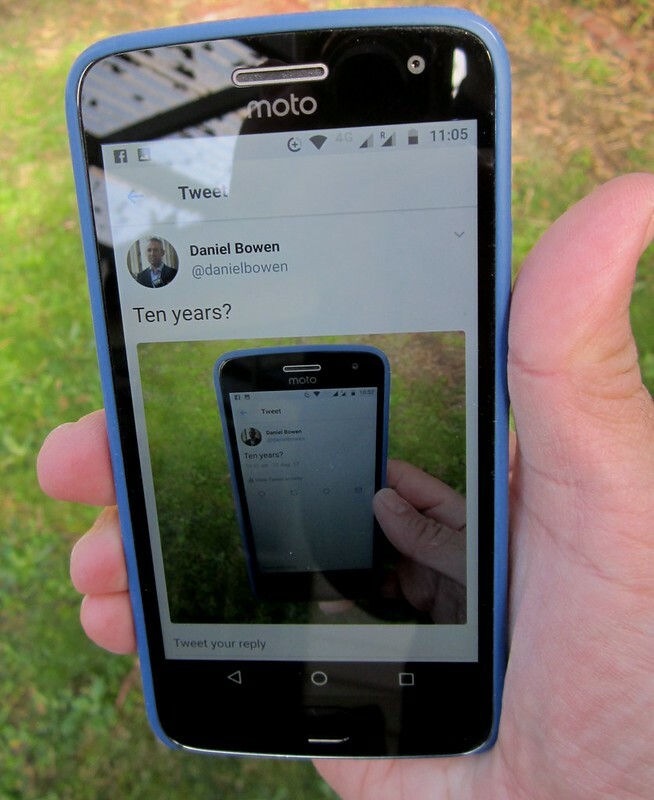 After the mess of the last attempt, and noting the large number of people reading on mobile devices (phones 39%, tablet 10%), I’ve switched to a plain but hopefully more mobile-friendly blog template. 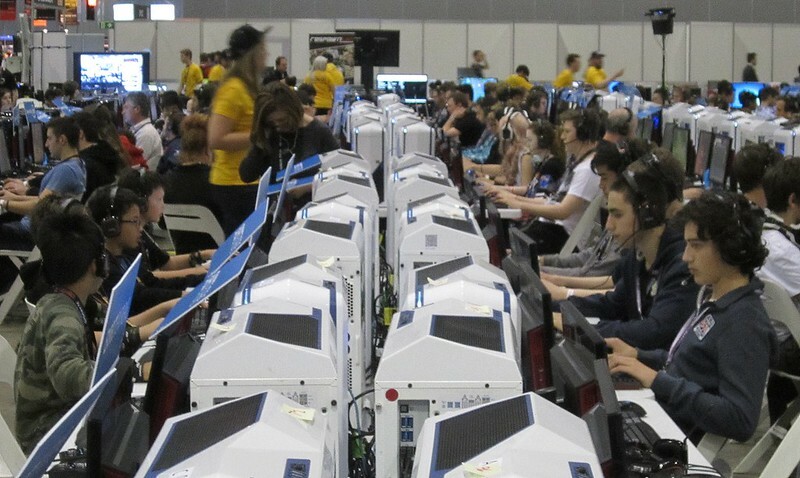 Here is a photo of some people doing geeky things to test the pictures. 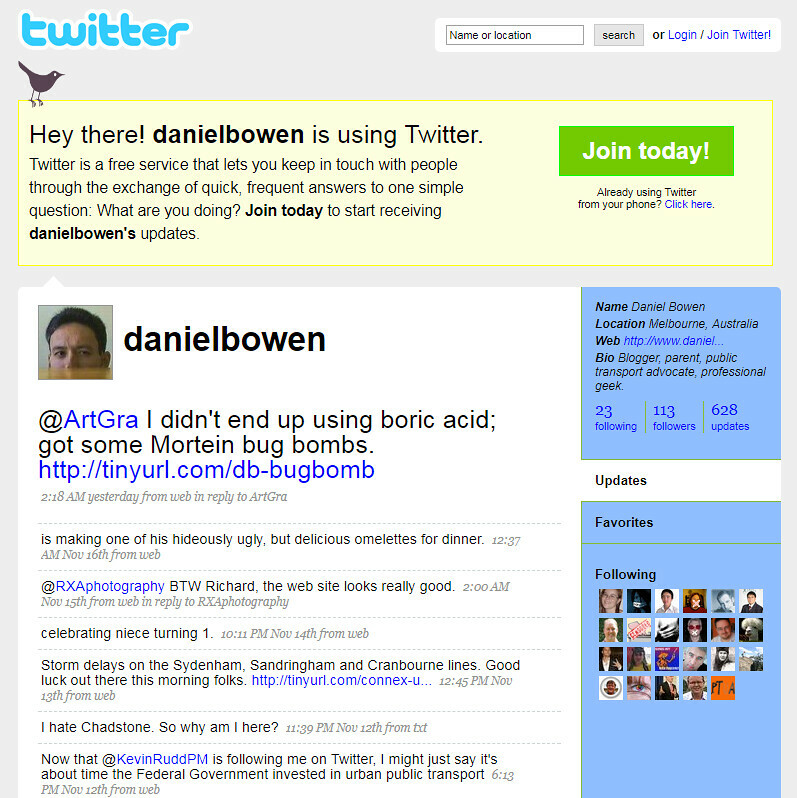 I’ll probably do some tweaking, but any feedback on how it looks (particularly on phones and tablets) is very welcome! 11/2/2016: The ads aren’t really in good spots on mobile — this requires some customisation. But most of the other mobile layout looks pretty good. 14/2/2016: Via a child theme and a plugin, I’ve enabled numbering on the comments. This was nowhere near as straightforward as I thought it would be. The instructions for creating the child theme in particular to keep the modifications separate from the parent theme were particularly geeky, but it seems to have worked. Not to pre-empt anything, but this year I expect to have two film and television students in the house. For this, I’m considering upgrading my Internet. We’re currently on iiNet Naked ADSL2+ costing $69.99 per month (for 1000 Gb of data, of which, to my surprise, we’re using about a quarter). Actually I’m paying an additional $10 for VOIP, but I’m planning to ditch it because we rarely use it, and it seems quite unreliable — the handset frequently can’t get a signal. I don’t know precisely where the problem is, but given everyone in the house has a mobile phone, it seems an unnecessary cost. Why upgrade the Internet? Well one of the things the boys have highlighted is the relatively slow upload speeds. This is important for film students, because these days everything is digital, and moving big video files around quickly is important. Our download speeds are okay. Our upload speeds… aren’t. This isn’t good. By my calculations it means that a 50 Mb file (which is not that big by modern video standards) would take 12 minutes, and that’s assuming no other bottlenecks. A 500 Mb file would take over two hours. This explainer web page from Optus compares theoretical speeds, and notes that the limit of ADSL2+ upload is 820 Kbps (eg 0.82 Mbps). The ADSL upload speed is so slow that when Isaac wants to send a big file to Dropbox (or whatever), it’s often quicker to go into campus (about an hour’s trip away) and do it there, then come home again. I suppose it gets him out of the house, but it’s not brilliant, is it. It’s not just study. He’s starting to do post-production work as a part-time job. This is the kind of agile digital economy PM Turnbull often drones on about. Cable internet is faster; around 3 times faster for uploads. DOCSIS theoretically allows faster upload, but queries from customers were answered in a vague way by Telstra. The speculation is the Telstra and Optus cable internet networks are set up for cable TV, which are pretty much all download. If only we had some kind of universal super-fast internet service providing a future-proof fibre connection to everywhere. Some kind of Network of Broadband right across the Nation. Well, I checked. NBN (especially proper NBN, fibre-to-the-premise/home, but even fibre-to-the-node) would be great, and would improve upload speeds by up to 50 times, but isn’t getting to my area anytime soon. Given their enlightened social media operative Dan, I’d be more than pleased to sign up for Optus Cable… if they serve my street. This is confusing as their web site variously says Yes or No depending on how I enter the address. I suppose I’m going to have to ring them up. Also notable: complaints about speed from local Optus cable users. Telstra cable does serve my street. Theoretically may get me about a threefold increase in upload speeds (around 2.4 Mbps), for $95/month for 500 Gb or $115/month for 1000 Gb — and appears to include a home phone service. Importantly, with cable there are no guarantees about speed — it depends on network congestion. I’m sure I’m not the only one in this position. Assuming I don’t want to pay a heap of money for a fibre connection myself, are there any other options? New (at lunchtime): Latency 1 ms / Jitter 12 ms / Download 27.61 Mbps / Upload 1.96 Mbps. New (at 6:15pm): Latency 78ms / Jitter 24 ms / Download 19.80 Mbps / Upload 1.29 Mbps. So download and upload speeds have both increased by about 3-4 times.